This special 12-inch vinyl pressing of “Hold Me, Thrill Me, Kiss Me, Kill Me” was issued for 2018’s Record Store Day Black Friday Event. The vinyl was released on November 23, 2018, and was limited to 7000 copies worldwide. Although available throughout the USA on that day there were delays reported elsewhere with only a portion of shops in the UK receiving the vinyl on time, and only a handful of shops in Spain, France and Canada receiving the vinyl, while many shops had to wait for their orders to be filled. On the A-Side of this vinyl is “The Gotham Experience Remix” a version of the song recorded by U2, but remixed by St Francis Hotel for this release. Instead of Bono on vocals, the vocals are done here by a longtime friend of the band, Gavin Friday. Also featured on backing vocals is Regine Chassagne from the band, Arcade Fire. This version of the song was recorded for use in 2018 on the band’s Experience + Innocence tour, and was used as an intermission piece each night of that tour. In 2015, Gavin had also recorded U2’s “The Fly” for use in a similar fashion. The song has been remixed by St Francis Hotel, who have worked with U2 on a number of other tracks in the past. 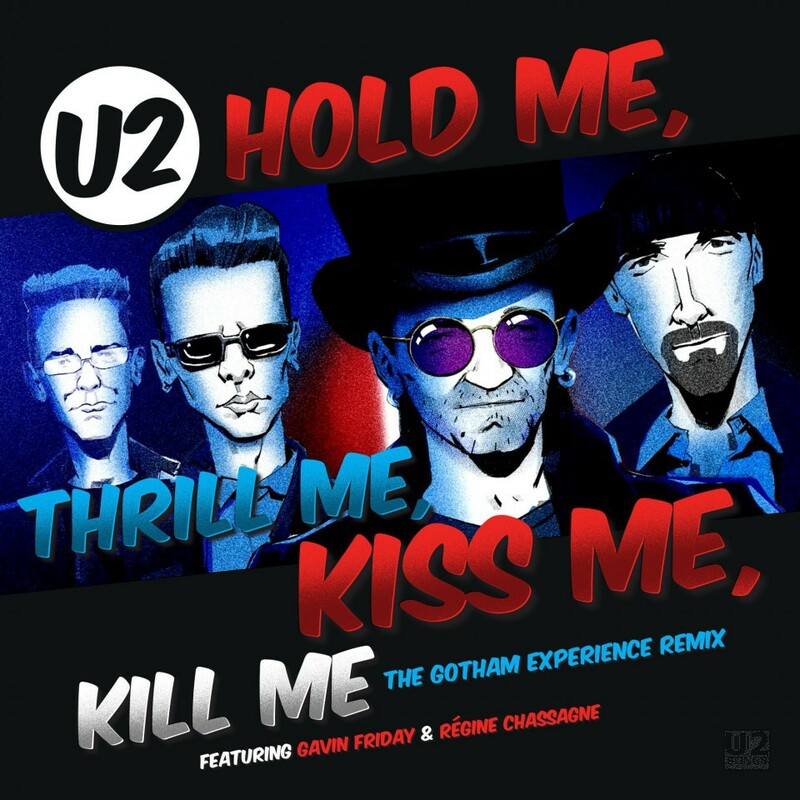 The B-Side of this release is U2’s version of “Hold Me, Thrill Me, Kiss Me, Kill Me” which has newly been remastered for use on the bands recent reissue of The Best of 1990 – 2000 on vinyl. The version used here on this release for Record Store Day is the version that has been used on the recent reissue of that album. The release was officially announced on October 8, 2018, but advance information about the release was leaked on the weekend prior to that date. The vinyl is packaged in an outer sleeve with raised lettering. The artwork on both the front and back sleeves are taken from the animated Intermission video from the tour. Inner sleeves include additional artwork. One shows frames from the animation in a graphic comic book style piece, which takes up both sides. Another image includes the lyric “In the headlights of a stretch car, you’re a star” with an animated photo of the band in front of a limo and a graphic star. Lyrics and credits are on the back of this insert. To commemorate this release some additional merchandise was released through the U2.com online store. This included the cover artwork on a black T-shirt which was sold by itself. Also the T-shirt was included in a package with a special screen print (420 × 594mm) featuring the front cover. By U2 featuring Gavin Friday and Regine Chassagne. Remixed in 2018 by St Francis Hotel. Mixed by Andrea Lepori. Vocals by Gavin Friday and Regine Chassagne. Gavin Friday recorded by Michael Hefferman at Lennox St Studios. Regine Chassagne recorded by Steve Mackey and engineered by Emre Ramazanoglu at Hoxa Studios, London. Additional Drums, programming and engineering by Richard Adlam and Hal Ritson. Additional guitar and bass by Rob Harris. Intro features quotation from William Blake from Songs of Innocence and Experience. Produced by Nellee Hooper, Bono and The Edge. Engineered by Robbie Adams and Flood. Mix Engineer: Mike “Spike” Stent. Programming and keyboards by Marius De Vries. Assisted by Paul ‘PW’ Walton. String arrangement by Craig Armstrong. Recorded at The Factory (Dublin), Windmill Lane Studios (Dublin), Wild Bunch Studio (London) and Olympic Studio (London.) Music by U2, Lyrics by Bono. Vocals: Bono. Guitars, Vocals and keyboards: The Edge. Bass guitar: Adam Clayton. Drums and percussion: Larry Mullen. U2 Manager: Guy Oseary. Creative director: Gavin Friday. Director of Production: Nadine King. Mastered by Scott Sedillo at Bernie Grundman Mastering. Sleeve designed by Shaughn McGrath, AMP Visual, Dublin. Graphic novel art taken from The U2 Experience + Innocence Tour, 2018. Creative direction, concept and storyboard by Willie Williams. Animation directed by Reza Dolatabadi with additional illustrations from Hamid Bahrami, Gareth Blayney and David Shepherd.